Natalia and I ran a stall in the McDonald Institute, alongside other stalls relating to ancient Mesopotamia. We offered visitors the chance to learn to write their names in three ancient languages: Greek, Phoenician or Ugaritic. Greek and Phoenician were written on a wide range of materials and objects, but for the sake of ease and portability, we offered papyrus as our main writing surface. For the alphabetic cuneiform of Ugaritic, we helped people try their hands at pressing the signs into soft clay with a stylus. It was an extremely successful day all round, with over 1000 visitors to the McDonald Institute. We were kept busy all day by a constant stream of visitors, overwhelmingly children. I’d expected that Ugaritic might prove a little fiddly and hard to explain for an event like this, with its unfamiliar repertoire of sounds and completely different way of forming signs, but I needn’t have worried – in fact it was the only writing system we ran out of handouts for! It was wonderful to see the interest in and enthusiasm for ancient writing, especially among the very young! We hope we’ve inspired a few future archaeologists, linguists or epigraphers. It was also very good fun, though more than a little exhausting! 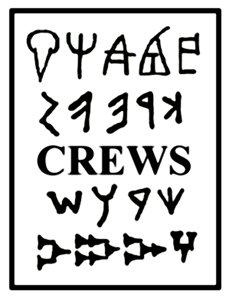 If you like the sound of trying to write your name in writing systems like Ugaritic and Phoenician, keep an eye on the blog in the next few weeks because we are planning to host some accessible resources that anyone can use. Many thanks to Laure Bonner of the Division of Archaeology for some of the photos here, and for organising the event. I wrote a bit for the CREWS blog about the outreach event I attended for the Cambridge Science Festival.